Is there something wrong with this tree? Poor guy, shouldn’t it have dropped its leaves by now? When walking through the winter woods, you may notice certain trees retaining their dead leaves. The term used to describe what you’re seeing is marcescence, a condition which may fulfill a variety of purposes (nutrient recycling, deterring animals from browsing buds, etc.). 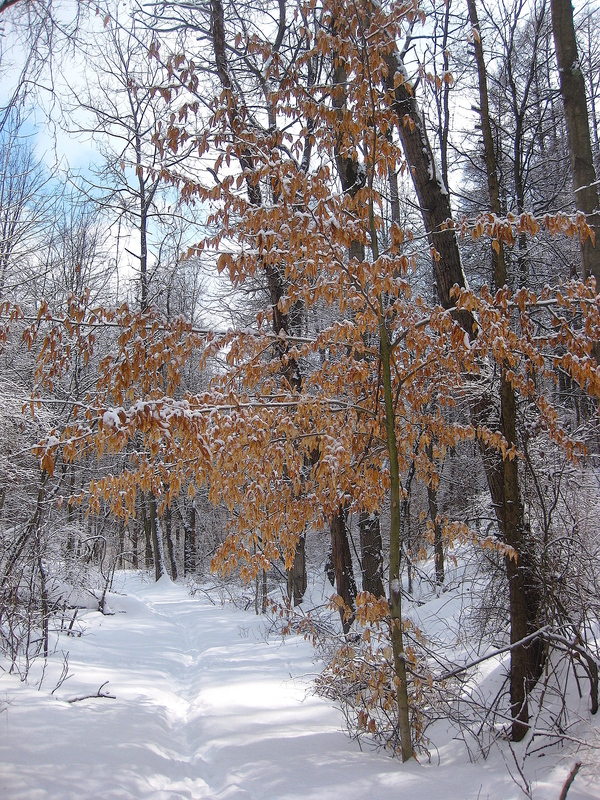 The American beech tree (Fagus grandifolia), pictured here, classically displays marcescence. Other trees that retain their leaves include oaks (Quercus spp. ), hornbeam (Carpinus caroliniana), and hophornbeam (Ostrya virginiana). You’ll occasionally see this with witch hazel (Hamamelis virginiana) and sugar maples (Acer saccharum) too. Even though spring is finally here, most trees have yet to bud. A good piece of winter/early-spring tree ID advice is this: if you see a deciduous tree in winter and early-spring holding on to most of its leaves, you may be able to narrow it down to the trees listed above… not always, but it’s a great starting point! This photograph was taken on March 2nd (my birthday!) at Moraine State Park in Western Pennsylvania.